The EMO terminal in the Rotterdam Port has been a major hub in transporting coal and iron ore from all over the world to the European hinterland. EMO has always been a reliable partner for its customers in helping to control these flows of goods by combining daily processes with a clear vision for the future. EMO is able to accommodate the world’s largest dry bulk vessels, and yet it never ceases to look to the future and plan ahead — now more than ever! EMO has strongly increased its storage and transshipment capacity and efficiency. This will ensure that it is fully equipped to enhance its safety, efficiency and sustainability performance, and to continue to serve its customers as a reliable partner in dry bulk transshipment in the coming decades. 160 ha stockyard; and v high-tech operations centre. EMO is a partner that its customers can rely on. The company stays on top of the latest developments in the market. EMO continually analyses customers’ needs, the quality of its services and its terminal’s performance. In anticipation of market trends and customer needs, it is continuously geared towards offering a more efficient, cleaner and safer terminal, one designed to meet all expectations. On its 160-hectare stockyard, EMO is able to stock 7mt of storage. EMO is ideally located on a 23m-deep waterway connected directly to the North Sea. The Rotterdam port has excellent rail and waterway connections to the rest of Europe. A new 1,070MWe coal/biomass-fired power station built by E.ON on a neighbouring site is currently in the test phase. The same applies to the 800MWe coal/biomass-fired power station built by GDF Suez on the eastern section of the EMO site. Both of these ultramodern power stations will be supplied by EMO. Construction of new sea locks at IJmuiden has now been given the all clear, enabling Amsterdam to receive far larger bulk carriers in the future, writes Michael King. Managers at Port of Amsterdam are confident of maintaining their leading position in the bulk carrier trades, now that a project to build a large new sea lock in IJmuiden has finally been given the green light. Lex de Ridder, Cluster Manager Energy at Port of Amsterdam, told DCI that the signing of a new administrative agreement by the Dutch Ministry of Infrastructure and the Environment, the Province of North Holland and the City of Amsterdam at the end of last year would accelerate construction of the lock by allowing bigger vessels to use the port’s slew of bulk terminals. The new locks will be 500 metres long, at least 65 metres wide and 18 metres deep. Although some of the exact technical details on how the extra capacity will translate into ship dimensions are still being calculated, the new locks are expected to allow ships of around 53 metres beam to enter the North Sea Canal to Amsterdam. This compares to the current beam of 45 metres. The new locks will also offer 17 metres of draught, up from 13.7 metres at the existing locks which were built in 1929. Under the administrative agreement, the three parties have agreed maximum financial contributions they will make to the project. An application will also be made for a subsidy under the European Union’s European Transport Network (TEN-T) programme, which subsidized the plan elaboration phase of the project. The tendering process for the construction of the new locks is already underway and they are due to be open for shipping in 2019. Port of Amsterdam is also looking to construct a new North Sea harbour outside the dock to help the lightering operation and further boost volumes. “We are investigating the possibility of co-creating a new energy port before the locks, including the creation of land/terminals space,” said De Ridder. “We’re in talks with a consortium of parties, including Tata Steel and the port of IJmuiden, and we’re speaking to the Ministry of Infrastructure and the Environment. Last year total seagoing traffic handled in the Amsterdam North Sea Canal Area totalled 97.8m tonnes, up from 95.8m tonnes a year earlier. Of this total some 48.3mt was dry bulk cargoes, up from 46.1mt in 2013. Coal volumes led the way, reaching 19.5mt excluding volumes handled by Tata Steel, which amounted to around 4–5mt, followed by ores (10.1mt) and various agribulk cargoes. However, the coal import market in Europe looks less promising for 2015. “For coal the last two years have been extremely good and even above what we expected, with up to 10% growth each year and this explains the jump from 18.9mt in 2012,” said De Ridder. “In the Northern Range there was a consolidation of coal imports to Rotterdam and Amsterdam and less went to Antwerp. consumption is lower due to more use of wind and solar energy, but it was impossible to keep seeing the growth we had. There was some oversupply, but this has mostly been drawn down now. Plans are also in place to boost handling of agribulk cargoes in tandem with Cargill. “We have a mutual plan to create new quays and a warehouse for agribulk storage, which will open next year,” explained De Ridder. “This is being developed now and the idea is to build this next to Cargill’s IGMA terminal. As well as handling imports for their own businesses here, which amounts to around 3mt per annum, they also import a further 5mt, which is then distributed around Europe. They want to expand by creating extra quay capacity and flat warehousing next to IGMA for storage of agribulk. They are investing in more flexibility and capacity and more room to compete and grow.” Last year Cargill moved her European head office to Schiphol in the Amsterdam area. The port’s fertilizer and chemical business also received a major fillip in January when Israel Chemicals Ltd. (ICL) opened its new European head office in Amsterdam on 29 January 2015. ICL has a long-standing relationship with the city and has been operating a fertilizer plant in the Amsterdam port area since the 1980s. The new ICL head office is expected to have 300 employees who will fulfil positions in a range of corporate support for its minerals, food and agriculture business services, including finance, procurement and human resources. ICL is happy to establish a second headquarters in the Amsterdam area. Port of Amsterdam CEO Dertje Meijer said the fact that ICL already had activities in the port of Amsterdam meant it was well acquainted with Amsterdam’s strengths as a logistics hot spot. “There are very short lines of communications and this creates the optimum conditions for collaboration,” she added. As reported by DCI last year, efforts to get more cargo through Amsterdam Container Terminal continued unabated. Launched in 2000, ACT was originally intended to offer a unique handling experience to container shipping lines by offloading containers with cranes located on both sides of the vessel. However, ACT couldn’t secure business on a large scale with lines, despite a series of ownership changes. Gans Cargo Operations Netherland B.V. was established in 1907 and is a typical shipping and forwarding company situated in the Rotterdam Port area. The company specializes in dry bulk logistics (a.o. petroleum coke, coal, agri, fertilizer and biomass), and offers tailor-made solutions for transporting customers’ products on a door-to-door basis. Gans Cargo operations ensures timely delivery of cargoes at competitive rates, terms and conditions including the ability to offer owned and/or long- term leased covered and non-covered storage capacity in the Rotterdam port area, alongside the river Rhine, the German canals and France (Supply Chain Concept). The company’s head office is located in Rhoon (Rotterdam Port area) and it has subsidiaries in Ghent, Antwerp, Flushing, Terneuzen, Amsterdam, Hamburg, Bremen and since 1 March 2015 an office in Alexandria, Egypt (JV with a local, strong partner). RO/RO, Reefer, Expo, bulk minerals), including a fleet of ten coastal vessels (box-shaped) between 2,000 and 8,000 tonne and the same number of breakbulk/project coastal vessels. Gans can cover the whole supply chain (Logistics) globally on a 24/7 365 days a year basis. With the dry bulk freight market at close to all-time lows, vessel owners need precision management to ensure that there is minimal value destruction. In an operating environment subject to the forces of nature, such as shipping is, less-than-favourable surprises do happen from time to time. Ship owners need to be comfortable in the knowledge that operating standards and quality management are in place. This will ensure that situations are anticipated and preventative action is taken so as to keep the financial implications of such events manageable. The attractiveness of Misuga Ship management to ship owners is that Misuga is a dry bulk vessel specialist. Of the top ten world-wide ship managers (by number of vessels under technical management), Misuga has the largest percentage of dry bulk vessels. Besides dry bulk vessels and specialized dry bulk ships such as wood chip carriers, Misuga manages container carriers and PCTCs. maritime heritage and the country’s vibrant large ports. Misuga Holland has capitalized on the talent in The Netherlands to establish a formidable ship management operation in Rotterdam in 2009. With the majority of Misuga’s 21 owned ships under charter to European interests, being in the same time zone as them, timely communication is easy. The newest addition to the Misuga fleet is the 61,000dwt Star Maine which was delivered in April this year by Iwagi Zosen, Japan. This yard will deliver another vessel to Misuga in the coming year. The Misuga Holland parent company headquartered in Japan, brings its wide range of resources across ship building and the shipping industry to give its clients an edge. The company’s offices in Manila and Hong Kong enable it to serve ship owners in that region. In Manila Misuga runs its own crew training department and manning facilities. In its first contract with Damen Shipyards Group, Netherlands- based Maja Stuwadoors took delivery of a Damen Spill Pontoon 2116. The new pontoon, called Maja 5, will catch bulk products that are spilled during the transshipment process. agricultural, energy and metal sectors. These cranes are typically positioned between the quay and the bulk carrier. During the unloading process, it is a common occurrence that some of the load is lost from the crane’s grabber and thus falls into the water. “This new pontoon can be seen as an extension of the crane pontoon,” comments Damen’s Benelux Sales Manager Roel van Eijle highlighting the spill pontoon’s principle function. “If bulk goods are dropped, they fall onto this spill pontoon instead of in the water.” As well as reduced loss of product, operators using spill pontoons will comply with European port regulations concerning water quality in harbour areas. As the first Damen pontoon to be constructed for this specific purpose, the Maja 5 demonstrates that high-tech specifications are not a prerequisite for innovation. Essentially a very simple concept, the spill pontoon has a large closed deck with a raised 8cm edge to prevent further product loss in addition to mooring bollards in each corner. Damen also outfitted the spill pontoon with two tanks with special closable deck dowels in order to collect polluted water. Constructed within eight weeks at one of Damen’s Chinese partner yards, the Spill Pontoon 2116 was transported to the Netherlands on Damen’s latest shipment of pre-purchased and built-for-stock vessels from local Chinese partner yards. The shipment arrived just a few months after the order — matching Maja Stuwadoors’ requirements concerning short delivery time. Two yard numbers have been sold, one to South America, one to Vladivostok. It is a smart designed product: main function is to load up to new-Panamax size bulk vessels. It can also be used for unloading large bulk vessels, lightering on a river, vessel to quay operations and temporary store cargo on deck. Besides grab operation the crane can be used for containers and in hook operation for project cargo; a versatile vessel which provides a flexible transshipments solution for ports or remote locations. Damen is also in the process of designing a range of standardized hopper barges and in the future will also start with a range of split hoppers. Dinnissen Process Technology has developed a new pneumatic Pick-Up Device for providing a constant inflow of powders, particles, and granulates in vacuum conveying systems. The Pick- Up works completely automatically on the basis of the transport pressure that has been set. Mechanical dosage devices such as sluice valves or screws are superfluous. Dinnissen’s new Pick-Up plays a crucial role in its innovative Slow Flow Conveying systems which can be used to pneumatically transport even the most fragile, sticky, and soft products quickly, easily and effectively. Slow Flow Conveying is the pneumatic conveying system developed by Dinnissen especially for the transport of fragile, sticky, and soft products. Slow Flow Conveying works according to the principle of underpressure or overpressure transport. Powders, particles, or granulates are transported from one or more inflow points to a single compact receiving unit with the help of a controlled flow of air or gas. In Slow Flow Conveying, it’s crucial to minimize the friction between the product particles in order to ensure that fragile, sticky, or soft products are transported as efficiently and gently as possible. To realize this, the transport speed is minimized, and the ratio between the amount of product being transported and the amount of transport air or gas used is relatively high. In order to carefully and gently transport fragile ingredients, it’s also crucial to ensure a constant supply of product to the conveying system. After all, a constant supply rate results in a proper loading factor, a smooth production process, and an optimum end product quality. Dinnissen has developed a new Pick-Up for vacuum conveying systems to ensure that, regardless of the product in question, the product can be transported through the system at exactly the proper loading factor and speed. Dinnissen’s new Pick-Up plays an important role in its innovative Slow Flow Conveying system. The Pick-Up is fitted with an automatically regulated air supply for the inflow of products. This ensures that an optimum amount of transport air or gas is used for each product. Via the automatic valve, the precise capacity for one or more inflow products can be chosen on the basis of transport pressure. This means that the proper ratio between transport speed and loading factor can always be realized even for products with very different characteristics. This makes it possible to transport even the most fragile, sticky, or soft products easily and quickly and without the use of mechanical dosage devices, sluices, or screw transporters. The new pneumatic Pick-Up Device makes it possible to reduce product damage and mechanical maintenance to an absolute minimum. Dinnissen Process Technology is presenting the new Pick-Up and its Slow Flow Conveying systems at the Achema exhibition in Frankfurt in June and at the Victam in Ko¨ln, also in June. Slow Flow Conveying is one of the conveying systems in the range of products supplied by Dinnissen. In the area of bulk transport, Dinnissen also specializes in dense phase and traditional air transport. Besides conveying systems, Dinnissen supplies technologies and solutions for handling, weighing, mixing, grinding, sieving, and packaging bulk goods. At the Achema in Frankfurt and Victam in Ko¨ln, Dinnissen Process Technology is presenting its latest Pandora End of Line Mixing concept for high-quality applications in the chemical, pharmaceutical, feed and food sectors that require fast, gentle, and cost-efficient mixing solutions. The Pandora End of Line Mixing concept is especially suited for situations in which costs have to be carefully managed without making any concessions in terms of quality. The new concept is suitable for mixing a maximum of 10 (micro) components and has a capacity of 50 kg up to 100 tons per hour. Pandora End of Line Mixing works according to the principle of continuous mixing, whereby raw materials are continually added and removed from a compact mixer. The concept is based on a combination of several accurate gravimetric feeders and the well-known Pegasus® mixer supplied by Dinnissen Process Technology. The special feeders accurately measure the supply of ingredients to the Pegasus® mixer, which can consist of micro- ingredients (0.01–2% per batch weight) and even extremely high percentages (30–220% per batch weight). Pegasus® mixer to be very compact, and it is this compact design that is responsible for ensuring that the overall mixing concept provides significant cost savings. integrated into the new mixing concept minimizes startup and switchover times for the production process and therefore minimizes the loss of finished product. The compact design also makes the mixer easier and quicker to clean, which also helps minimize production downtime. The mixing concept is therefore especially interesting in situations that require frequent switches between recipes. The compact design of the Pandora End of Line Mixing concept means that less space is needed to install it in a new environment or to integrate it into an existing production line. Pandora End of Line Mixing can therefore be integrated into the production line just before the packaging process, thereby minimizing the risk of product segregation. The Pandora End of Line Mixing solution can be supplied as a stand-alone module to be built into new or existing production processes or as a complete production process. The Pandora End of Line Mixing solution will be showcased at Dinnissen Process Technology’s stand at the Achema show in Frankfurt and at Victam in Ko¨ln, also in June. Dinnissen also supplies an extensive range of batch-based mixers. In order to live up to the high standards of the global dry bulk market, RC Inspection understands the international value chain from A to Z as no other. Offering team members with more than 40 years of experience and know-how, the company is able to grant the clients the highest quality to be found in the field of inspection, sampling and analytical services. designed internal procedures to inspect and sample the complex heterogeneous cargoes which are the basis and crucial part of the quality process. The company offers great expertise as well for services such as deep temperature control, infrared temperature control, size distribution and stockpile/terminal inspections. RC Inspection provides its services also on other dry bulk commodities such as metals, minerals, non-ferrous ores/concentrates, noble alloys, bulk alloys, high purity-, base-, precious and rare earth metals. The controlling operating offices of RC Inspection are strategically based around the globe, operating worldwide and represented in each important, active economic centre. This gives the advantage of being able to perform the services at short notice and guarantee unbeaten turnaround times for reporting and analytical results. All global services are co-ordinated from the head-office in Rotterdam where a permanent team of specialists in dry bulk commodities is based. Except for its skills, the company places high value in a personal relationship with the customer. By adding a personal touch in the communication and services, RC Inspections aims to make a difference in providing the customer’s needs. The core business philosophy is to provide independent, fast and reliable services with a direct people to people approach as befits a modern inspection company. As RC Inspection aspires independent, fast and reliable services for the analytical results, the company keeps the analysis in-house conducted by its extended sister company RCI Analytical Services. The laboratories are strategically located in The Netherlands, Ukraine and Mongolia and equipped with the most modern and advanced instruments to drive accelerated turnaround times and up- to-the-minute reporting through a service driven approach and innovative use of technology. RCI Analytical Services provides chemical analysis for RC Inspection Group companies and its related customers. The analyses are performed using all relevant modern analytical techniques such as ICP-OES (Inductively Coupled Plasma-Optical Emission Spectroscopy), X-ray Fluorescence, Instrumental Gas Analysis for all relevant gases, X-ray Diffraction (XRD) Analysis. Additionally RCI Analytical Services performs analysis on commodities such as gold and silver in copper- and lead- concentrates by dissolution of the samples and analysis by GF (Graphite Furnace) and F-AAS (Flame Atomic Absorption Spectroscopy) and high concentrations are determined accurately using precision titration. With future prospects under the loop, RCI Analytical Services is working on getting all the laboratories accredited under ISO/IEC 17025. Besides rendering analytical services, the company also offers the supply of analytical equipment, auditing of laboratory management systems and implement/manage laboratories as outsourcing to the industry. As the global dry cargo market is rapidly developing, RC Inspection is adapting to all necessary requirements to deliver only guaranteed high quality services. Since 2009, RC Inspection has been certified according to the ISO 9001:2008 Quality Management System Standard. In January 2015, the company has strongly expanded the scope of services and have been granted a new official certificate of approval. As of April 2015, the company is proud to announce it is now accredited as by ISO/IEC 17020:2012 compliant organizations with registration number: I 308. RC Inspection underwent an evaluation process that included quality management system development, management system documentation review, pre-audit, initial assessment and clearance of non-conformances, all of which work to identify corrective actions that eliminate non-conformance to the quality management standard. The accreditation of compliance with ISO 17020:2012 recognizes that the policies, practices and procedures of the company can be ensured with consistent quality and excellent expertise in the knowledge of the products and the provided services. With this accreditation, the clients can be ensured that RC Inspection is dedicated to maintaining the highest efficiency and responsiveness in achieving its ultimate goal – guaranteed client satisfaction. and ore. The new quay would be an extension of quay four and had to be suitable for a crane track with a maximum load of 600kN/m1 (60 tonne/m1) over a length of about 430m. The other challenging aspect of the project was that during the construction stages, the client still needed to use the operational systems (corner towers and conveyor belts) and as such, they could not be affected.Volker Stevin International’s sister company Volker InfraDesign answered the challenge with a winning quay design so unique that a patent was requested! They opted for a solution with a focus on sustainability and opportunities for innovation. The engineers integrated the quay with the fender and replaced the traditional steel fender design with a protective shell of steel fibre-reinforced high strength concrete. The concrete mixture has a very high resistance against peak loads and is very hard to penetrate. Steel fibre- reinforced high strength concrete is also not vulnerable to wear and tear and this combination made it the ideal product to make the quay barge proof. To avoid possible damage to moored sea vessels UHMW-PE strips were bolted to the concrete at a 10m interval. The substructure consisted of a more traditional solution with a combi-wall. At the rear vibro piles and SG-anchors were used. The solution avoids high maintenance costs of the fenders. 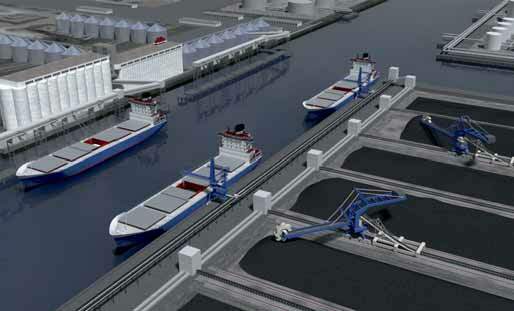 In addition, the distance between the ship and the quay is reduced, resulting in less waste loads in the water. Less waste means less spillage, less dredging, and more profit! By using virtual building software and simulating every important step for the construction of the quay, the client and the engineers were able to follow the project developments at any moment and from any location. This tool was extremely valuable as business continued as usual in the harbour. Also, the project was located in a bird nesting area and special precautions were needed to avoid interrupting the breeding process. The tool made it possible to make quick adjustments. The Port of Rotterdam has been using the quay and the fender system since the summer of 2012. The quay has been used by barges, inland vessels and sea going vessels. Up to now no damage has been seen on the wall. Captains are deterred by the concrete wall and moor their ships extra carefully. All parties involved are pleased with the result. Building on years of experience, Premier Tech Chronos (PTC) is recognized worldwide for its innovative and customized weighing, bagging, palletizing and load securing solutions for various process industries. It has been providing manual, semi- automatic and fully automated solutions for bagging a wide range of materials since 1881. Premier Tech Chronos has developed a comprehensive range of equipment to meet the specific needs of handling a variety of dry bulk materials found in dockside locations. This includes several innovative open mouth bagging systems to accurately handle most free-flowing materials precisely and at the speeds required by the dry-bulk material sector. As the European Business Unit of Premier Tech’s Industrial Equipment Group (IEG), PTC is an integral part of the number one worldwide supplier of Industrial Flexible Packaging solutions. The company has a global presence both in terms of countries, and market segments served. PTC is also recognized worldwide for its innovative and customized solutions based on deep technological knowledge and expertise. Details follow about some of the latest products. The OML-1080 is a compact open-mouth bagging unit that has a packing rate of up to 800 bags/hour. Built with stainless steel contact parts this machine is suitable for bagging free-flowing materials into open-mouth bags. OML-1080 can handle bag sizes 5 to 50kg; and is suitable for products such as grains, flaked materials and some powders. An innovative part of the OML-1080 is an automatic bag spout adjustment facility that enables a wide range of bag sizes to be accommodated. It has a compact design for installation in sites with restricted space, in-built dust control features for clean operation and all through the filling process control of the bag top is retained. The OML-1080 is easy to clean and maintain and can be supplied with integrated nett or gross weighing systems matched to the output requirements of the installation. Different types of bag material can be handled on the OML-1080 and all common types of bag closing system can be integrated into the packer; as can bag turning systems. Closed bag ‘push-off’ can be either top or bottom first. The OML-1080 is PLC controlled and is supplied with a user-friendly HMI (human machine interface). The in-built diagnostic display provides instructions to the operator for trouble shooting of the various operating functions. The OML 1140 offers high-speed bagging at rates of up to 25 bags/minute (1,500 bags/hour) and features a modular design for optimum versatility and maximum output, whatever the product being bagged. Typically it operates for bag sizes in the range of 5 to 50kg. This innovative and versatile bagging system can be easily used for any application that uses pre-made open-mouth (pillow or gusseted) bags made of paper, plastic or woven polypropylene. The result is a highly effective system for bulk material bagging of sugar, salt, fertilizer, nylon resins, animal feed, grain as well as materials from the chemical and construction industries. OML 1140 uses field-proven technologies for continuous reliable bag transfer and it retains total bag control throughout the entire packing process.This ensures high speeds are maintained without compromising the quality and efficiency of the bag closing process. OML 1140 also features a unique bag separating system that can accommodate all types of bag and is designed for quick change-over in less than five minutes. Proven in many different installations since it was originally introduced to the North-American market in autumn 2006, the OML 1140 has now been adapted to the European and Asian markets and is now available worldwide. Specific features include: fully automatic operation; total bag top control; high speed bagging; empty bag handling for all bag types; advanced control software; easy to clean; simple to adjust. The versatile PTR-1030 Series Open-Mouth Bagger (patent applied for) for European sales was launched in 2014.The innovative open-mouth bagging system can pack dry free-flowing materials at rates of up to 1,000 bags/hour and is suitable for use with a range of bag types and sizes. An upgrade option is also available that allows the PTR-1030 to successfully handle porous woven polypropylene bags. PTC has used its well-proven experience as a certified FANUC Robotics integrator to carefully incorporate two robotic arms into the PTR-1030. One robotic arm handles empty bags to accurately position them on the filling spout; while the second robotic arm removes the filled bag for transfer to the closing system. By separating out these basic operating functions to different robotic arms has enabled PTC to enhance the speed of the PTR-1030, which has also benefited from the proven reliability of the FANUC Robotics, which is an international leader in the manufacturing of intelligent robotic solutions. PTR-1030 is the most versatile robotic open-mouth bagging system available to industry. This versatility is achieved by its ability to handle a wide range of bag types and sizes. This includes: gusseted or pillow type open-mouth bags; made from either paper, polyethylene; laminated woven polypropylene; and porous woven polypropylene bags. Bag widths in the range 279 to 610mm; and bag lengths of 457 to 1,016mm can be successfully handled. The way the robotic arms are programmed allows the PTR-1030 to provide optimum bag changeover times, when changing to a different packing schedule, a different product or a different type and, or size. The empty bag handling robot can also be upgraded with a vision system, which realigns the top of the bag during the empty bag placing motion, thereby optimizing the bag shape for subsequent bag closing process. All machine contact parts are made of 304 stainless steel and the filled bag transfer robot has been designed for compatibility with all types of bag mouth closing systems. To help ensure a clean filling process the PTR-1030 incorporates a bag-on-spout detection system to avoid any product spillage. The compact design and footprint of the PTR-1030 allows its easy incorporation into sites with limited space and restricted heights. Its robotic operation means it requires less maintenance than conventional baggers and it ‘learns’ to make its own optimization adjustments. The use of smart wiring technology enables simple and speedy on-site installation/commissioning. PTC is able to offer the right bagging solution to meet individual customer requirements. This can be achieved by installing standard equipment, or by working with them to design a customized equipment solution to meet their specific site requirements. Over the last 15 years, in order to offer the most reliable line of packaging and palletizing equipment on the market, Premier Tech’s Industrial Equipment Group (IEG) has developed a strategic partnership with component supplier FANUC Robotics, an international leader in the manufacturing of intelligent robotic solutions. In addition to being a certified FANUC Robotics integrator, IEG is the number one manufacturer of robotic palletizing cells in North America. Thanks to its superior robot technology, customer service, and process expertise, IEG is a good choice for companies looking to gain a competitive edge. Wuvio Chemicals International BV, a Dutch supplier of dust treatment products with subsidiaries in France and China, was asked by one of Europe’s biggest bulk handling installations to help them in combating their dust problems, writes ing. J.P. Lange, Manager Development & Production, Wuvio Chemicals International BV. This terminal has a surface of 340,000m2 and can store 800,000 metric tonnes. The lump sum length of conveyor belts adds up to 12km. Annual throughput is around 15 million tonnes. The materials that are handled are mainly iron ore and several types of coal. Dust suppression is needed at every point that the dry bulk is moved and/or subject to wind, so at unloading from vessels, internal transport via conveyor belts, reclaiming via transfer points and conveyor belts, storage and loading into trucks. Conventionally, dust suppression is often carried out by the use of abundant water, which is bad for the environment, involves extra cost and can influence the quality of the coal and iron ore. Since every terminal has its own installation, a site survey is one of the essential keys to success. activates the dosing units, the addition of a synergetic mixture of surfactants is required. When configuring the optimum, the total amount of water required can be reduced by at least 80% by choosing the proper type of additions and equipment. To reduce the amount of dust (breathable and alveolar dust emitted at each treatment point and in winds of less than 4 Beaufort) with at least 75%, not more than just 2.5 litre Dust Repressing Liquid per tonne of dry bulk (coal, iron ore) is necessary. This Dust Repressing Liquid is a mixture of 0.50 litre Freko Humidifier per m3 water. Based on an average unloading speed of 2,000 tonnes per hour, an amount of only 2.5 litres of Freko Humidifier per hour is needed. When reclaiming, an average speed of 1,200 tonne coal per hour can be achieved. This cargo is transported via very long conveyor belts.To prevent dust emission, spraying nozzles are to be installed at the first Transfer Point. Using a pre-dilution of 10% Freko Foam, a dosage of 0.4% Freko Foam at the nozzle should be dosed in an amount of approximately 6m3 of pre-dilution per hour. This equals an amount of only 20 gram Freko Foam per tonne of coal. Application of approximately 20 gram Freko Crust per m2 is sufficient to create a protective layer that will last up to one to three months, depending on the weather conditions. This product can be applied easily with the use of a spraying canon, using a tank containing the premix. Best result is reached when approximately two litres of premix per m2 are applied. Several high stockpiles (approximately 20m) have been treated with 20g/m2 Freko Crust by means of a transportable fogging unit with a water capacity of 2,000 litre. The fogging unit can handle a maximum flow of 14,000 litres per hour at a pressure of 6 bar (coming from the tractor). It was easy to reach the top of the stockpiles. To increase visibility on coal and petcokes, a natural pigment will be added. After application, a green or yellow layer will be formed (instead of transparent).This development will be ready for introduction around Autumn 2015. A green variety for the treatment of sand is ready for production. OVET B.V. offers a wide range of stevedoring services in the Netherlands. It can handle commodities including: coal, coke, petcoke, ores, minerals and scrap. The main activities of OVET are lightening, discharging, storing and distribution and screening of solid fuels, ores, other bulk cargoes and scrap. Using four floating cranes (3 x 25 tonnes and 1 x 36 tonnes lifting capacity) with a total capacity of 80,000 tonnes per day, OVET also has the flexibility to operate at anchorages both in Terneuzen and in Vlissingen. The draught in Terneuzen is set to 12.50 metres freshwater, making the terminal suitable for Panamax vessels. In Vlissingen, the draught is 16.50 metres saltwater. Vlissingen has two Capesize berthing facilities plus one Panamax berth. Terneuzen and Flushing offer excellent connections (inland waterways, rail and road) to the European hinterland and UK, Ireland and Scandinavia as well. The terminal in Vlissingen disposes of a mobile ‘Multidocker’ quay crane which can handle sea vessels, coasters and barges. The river Westerscheldt (which ends up into the North Sea) disposes of two anchorages,Terneuzen Roads andVlissingen Everingen.Terneuzen Roads is suitable for the lightering up to Panamax vessels and Vlissingen Everingen is accessible to Capesize vessels. At the Vlissingen terminal OVET operates a warehouse of 6,000m2 for the covered storage of all kinds of dry bulk products. The warehouse contains six separate cells and each cell measures 7,500m2 and can be fully ventilated. The philosophy of OVET is Quality and Flexibility. To ensure its quality, OVET is certified with ISO 9001, ISO 14001, GMP+ and AEO. OVET Holding holds 50% of the shares of OBA, the bulk stevedore ofAmsterdam,whichmeansmoreserviceand flexibility for the customers of both OVET and OBA. OVET itself is owned by Oxbow for 50.1% and HES International for 49.9%. Affiliated to OVET is the Shipping Agency OVET Shipping which offers a reliable 24-hour service throughout the River Scheldt area. This guarantees an efficient and effective handling of customers’ vessels. Another affiliate of OVET is OVET Screening, a company which is specialized in screening, crushing and blending activities. At both terminals OVET operates (mobile) screening and crushing installations. The Vlissingen terminal owns two mobile screening installations (Lywell). With these machines OVET is able to screen dry bulk material up to five sizes with a maximum input capacity of 400tph (metric tonnes per hour). Because of its flexible layout and mobile equipment OVET is capable of making 100% homogeneous blends. By means of mobile stackers and conveyor belts, weight determination, etc. the blending operation is executed with the greatest care. Since 2014, OVET has had a new grinding installation to grind or pulverize wet/sticky material, also known as schlamm. After pulverizing the product can be blended with ‘dry’ material. At the end of 2014, a new coal washing plant was constructed at the Flushing terminal. OVET’s customer operates and runs the plant. In 2014 OVET further developed its new state-of-the art train loading station available at its terminal in Vlissingen/ Flushing. This new piece of equipment will allow OVET to receive 44 wagon trains in one length. A 24-hour round-trip to e.g. different locations in the German Ruhr area has proven to be successful. The station has a maximum loading capacity of 1,500tph and is equipped with an automatic weighing system. OVET already runs trains on a daily basis with a load factor of 100%. With the new installation OVET is able to load the weight up to kilogram accuracy. The train-loading facility has a glycol installation and a de-ironing magnet at its disposal. Over 1,250 metres of rail track is available at the terminal of which 675 metres is double track. The new infrastructure enables Ovet to have access to the European hinterland by rail. In March this year Ovet also launched its new website. terminal operators it is critical to make any investment plan with an analytical and dynamic approach. Simulation-based tools assist operators in choosing where to invest and determine the potential profitability during every step of their respective investment and development plans. TBA uses a structured and proven approach in terminal planning and design. The main focus of its approach is to arrive at a design that balances storage and handling capacity, OPEX and CAPEX. TBA uses specifically designed modelling templates and advanced proprietary simulation models to validate the final conceptual design. With this approach, it can determine the operational performance of the overall facility, identify potential bottlenecks in the system, determine service levels on waterside and landside, and equipment utilization. These quantitative analysis tools are applied for other services more rigorously, assisting in decision making towards finalizing terminal design and/or capital investments. Based on the terminal’s objectives, design criteria, collected input and assumptions,TBA (pre-) calculate the annualized throughput capacity of berth, storage, transport system, gate and rail facility. The company uses static models as well as its dynamic simulation model TRAFALQUAR Bulk. The aim here is to balance storage vs handling capacity of the various components. TBA uses its experts and logistics background to analyse all aspects of operations including IT control. TBA can then identify bottlenecks and propose solutions to improve operations. This approach is aligned with the Six Sigma principles. With its simulation models,TBA assess for the most promising alternatives whether they achieve the required performance levels, and what it takes to achieve the performance targets e.g. in terms of equipment performance, operational procedures, TOS’ characteristics. TBA has extensive experience in specific bulk handling systems; taking into account the characteristics, equipment capabilities and operational requirements for each material. Its bulk experts have done projects in a wide range of materials at various locations in the world, including large-scale major bulk, smaller multi-products agri-bulk, biomass and breakbulk terminals. TBA has been involved in various bulk projects, extending its vast expertise in consulting terminal operators in strategic, tactical and operational studies.TBA’s project methodology, with its proven approach, has been applied to various bulk terminals in the world. TBA’s services have been proven to add value to existing terminals by improving operational efficiency, helping existing terminals plan for future expansion and validating design for Greenfield terminals. TBA’s project portfolio covers terminals handling agri-bulk, coal, iron ore, sulphur, sugar and more; having worked for major bulk operators including Cargill, Louis Dreyfus,Vale, Impala terminals and Petronas. Headquartered in The Netherlands,TBA is a leading international provider of consultancy services and software with 20 years of industry experience. Its vision is to improve the cost efficiency and productivity of container and bulk/break bulk cargo terminals worldwide through the application of expert consultancy and innovative software. TBA’s difference is clear: it deploys state-of-the-art simulation and emulation software solutions for clients that include all major global container terminal operators as well as many local port operators.